Tons can be said about the Cannes film festival but I would like to say, first and foremost, that it really does bring out the pun-ster in all of us. In my opinion, it benefits everyone if we get full mileage out of the Cannes/can (Also Can-can!) homonym situation. Secondly, this particular festival also seems to bring out the extreme glamour in all of us. It is such a romantic and fabled setting that women attending have historically been moved to don some of the most extraordinary gowns. This year's representation has not disappointed thus far. Shall we? Lest you think only Cate Blanchett is allowed to attend the festival, let's review a few other stunning looks of which there were many. Cannes also seems to inspire bold color choices which never fail to delight me! This mossy green on Winnie Harlow is so stunning. And those strappy gold sandals are the perfect complement. Bruna Marquezine looks lovely in this Philosophy Di Lorenzo Serafini gown. Polka dots are the salve for all that ails me. She appears so regal in this Armani and the color is ethereal and charming. The fit is also sensational! While this request from headquarters was not unreasonable, I must remind you, dear reader, that these were days prior to Zac Posen grabbing the creative reins of Brooks Brothers Women's collection. Suffice it to say, there was nothing as crisp and tidy as the Carolina Herrera-inspired ensemble that Yara Shahidi is wearing in the above photo for the Brooks Brothers Bicentennial Party. I ended up in a black gown that I was fairly certain I'd seen on Blanche from the Golden Girls. Let's put it this way - it looked better on Blanche since my physique resembles that of a 12 year old boy. Years later I am pleased to see that the BB Bicentennial Party had a modicum of gravitas which I credit wholly to Zac Posen and his lady posse (Possen?!). Let's look at how he dressed his pals. Ladies and gentleman, all this to say that these gowns feel current and reflect well on the two hundred year old brand. May they never again match their styles to the age of their brand. Girlfriend looked like a 2 year old cut her hair then slapped Vaseline in it and she's still a straight 10. Standing O, Zoe! THIS dress. This DRESS. THIS DRESS!! I would not have pegged this as a Calvin Klein but sometimes his genius prevails. The rhinestone elements are making it necessary for me to breathe into a brown paper bag. Not to be negative but I would say that Nicole's head has looked more perfect in other applications but obviously she is still killing it here. Maybe it's just that her hair is a wee bit limp. No matter: Standing O! I rarely think that pants are as effective as a dress on the red carpet but this is the clear exception. Claire Foye in those rhinestones and shoulder cape are winning on the red carpet and at life in general. Standing O! Yara Shahidi in Prada makes me long for my youth. Her skin looks like the night stars are shining from within her. The dress and belt are the things that dreams are made of. Standing O! One thousand points for Effective Use of Color. Viola Davis wearing this orange Zac Posen is an image I will be holding on to when it is cold and dark and I need something to comfort me in a time of deep distress. Standing O! Remember that time of deep distress I mentioned moments ago? Witness Ariel Winter. Hell No! "Cannes you please stop everything and blog some dresses?" When I was a child I remember being told that Satan takes on many forms. That frightened me. Clearly I had no idea what true terror lurked out there because this Alexandre Vauthier hadn't yet been designed. It seems a fitting time to evoke Hell as in Hell No. If Versace needed to update its resume, my suggestion would be to simply insert this photo of Uma Thurman. The technical fashion term "amaze-balls" comes to mind here. What also comes to mind is Naomi Campbell wearing another version of this dress to the Golden Globes and also killing it. Standing O. Apparently Cara Delevingne (above) was coerced by Saint Laurent to submit to each and every grouping. However, while I don't typically recommend shaving your head and also matching your lipstick to your boots, somehow her top quarter still looks stunning. And that, in a nut-shell, is why she is a model. Overall though: So-So. If this Zuhair Murad dress was not entirely see-through then I would have to argue that it was too demure for an MTV event. However, since her entire body is on full view like a menu in a restaurant window, it indeed satisfies categories #1 and #3 and is therefore acceptable fare. Standing O! Yara Shadidi's face is absolute perfection. (Doesn't she resemble Chilli from TLC?!) She is a glorious beauty but whereas I covet all of the pieces of her Gucci outfit separately, I'm unconvinced that they should all be playing on the same team. I'm going to say So-So since each component has extreme independent merit and since this ensemble addresses categories #3, #4, and #6 and since I'd abandon all of my morals and good sense to have 1/10 of her natural beauty. Ok, ok, the entire outfit isn't skin tight but the pants are. Don't argue with me. This insane Balmain concoction is a straight up Hell No. But still she remains TARAJI-Flipping-P and cannot merit a Hell No. Instead I will impart a So So. Lent begins Wednesday which is disconcerting to me on many levels (but perhaps not as disconcerting as being told you won Best Picture and then NO! There's a mix up and you, well, LOST and have to slink back to your seat after having already thanked the Academy, the world, and your first grade teacher.) Back to Lent. When Dakota Johnson emerged onto the carpet in this Gucci number I emitted a high-pitch squeal that only dogs and ghosts could hear. 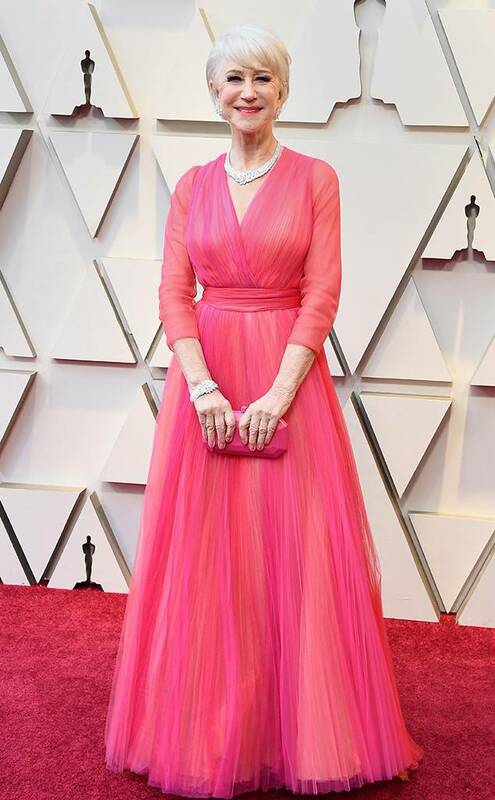 Somehow this photo is forgiving her a few sins but note that despite its pretty and appropriate color, this dress was too long, too wrinkled, and most egregiously sported that ridiculous bow. Toss in the un-glamorous and unflattering hair and the drab make up and you know what you get? A HELL NO! I love Leslie Mann. Love. She is adorable and funny. And so I feel agitated that this dress was im-Posened on her. (See what I did there? The dress is by Zac Posen and he, well, okay, you get it.) I don't know if Zac was inspired by the upcoming feature film Beauty in the Beast but this appears to be some weird wrinkled version of Belle's dress. Hell No. As Lent would dictate, let's turn the other cheek and begin to appreciate all that was good on the carpet last night. Despite the overall absence of color and heavy reliance on metallics several women still stunned. But to be honest, I wasn't calling for smelling salts over any one of the dresses. Instead, my favorite looks were the sum of all parts. My most favorite (and a perfect example of the equation I reference) was Emma Stone. She brought so much gravity to her big moment with her flawless hair and make up. Her Givenchy dress was quite pretty but, for me, it was more about how every element came together. To steal a word from her acceptance speech she was a confluence of old Hollywood glamour, modern beauty, and charisma. Standing O for her overall look and for her big win! I wasn't a fan of Emma Roberts's Armani Prive gown and so I won't bother to feature it (and her chest-thong), but her head was perfection and I'd be remiss not to comment on it. Standing O for her stupendous hair and make-up (and natural beauty of course). Hailee Steinfeld wore an extremely sheer Ralph and Russo dress that was very pretty but would not have bowled me over had her make up and hair not agreed with it so perfectly. Overall, though, she was luminous and abounded with modern elegance. Standing O! Don't get me wrong, this black Dior is classic and lovely but it is not earth shattering; And it would not have catapulted Kirsten Dunst onto my best dressed list had she not supplied the incredible body, gorgeous make up and hair, and understated but completely on point necklace. Standing O for taking a simple look and elevating it to greatness! There is something very Alexis Colby about Taraji P Henson in this Alberta Ferretti. Taraji looks like she could just as easily toss a glass of champagne in someone's face as she could accept an Oscar. Her gown is elegant but the success of this look is a testament to the attitude which she is bringing to that slit and that neckline. Bonus points for her new shorter hair - tousled, modern, and gorgeous! Standing O! I will take refuge in this photo when mid-Lent my resolve starts to waiver and I feel the urge to dissect a look ungenerously. With great looks, Ryan, comes great responsibility and you will need to help see me through. Michelle Dockery was topping my chart until Yara showed up at which time I had to bump her down to number 2. Even as runner-up she is glorious, and for many of the same reasons I cited for Yara - the color, the stripes, the levity! Perfect choice. She looks refined and sophisticated and completely on point for the SAG red carpet thanks in large part to Elie Saab for designing this beauty. Standing O! I adore a liquid metal dress and she/Louis Vuitton are using this concept to great effect. Her figure looks flawless as does her make up and hair (which, magically, seems to weigh in between a gold and silver color). She is almost achingly beautiful and when I reflect on her performance in Manchester By the Sea, the word devastating comes to mind. It's applicable to this look and to that role in equal measures. My only criticism is the choker. I've never been a fan, and while I think that it does break up the real estate between the deep v and her head, I would've liked to see some sort of long and delicate chain instead. At any rate - Standing O! I refuse to climb aboard the hate train where this Gucci gown is involved. I fully support a red-head in green and this particular shade is glorious! I also truly dig the feathers on her shoulders - they are luminous and unexpected and lovely. And I'm not mad at her for the parrot heads - they are fun and shimmery and represent a risk which, I argue, paid off. If I could tweak any part of this, I'd have made that a tight fitting straight skirt with a slit but these are minor details. I love that she chose this dress at this time for this event. She certainly has the wattage to carry it off. Therefore I would like to request that everyone get OFF OF HER BACK (AND SHOULDERS!!) FOR GOODNESS SAKE!!!!! Initially I was on the fence about giving her a Standing O but feel I need to come out strong on this one since there is so much dissent. So let me go on record: Standing O for keeping it interesting! The People's Choice Awards happened Wednesday night. What's that? You weren't aware? Well, apparently no one was except for J Lo who alone brought her A Game. Let it be said that, like Naomi, she must also collude with The Devil because the years pass by and she remains perfectly...perfect (her love life not withstanding). Here she looks like the sexiest version of Morticia Addams I have ever seen. (Drake can be Gomez!) This entire look delights me as does her agelessness: Standing O!